A vital component of your dental health is replacing any teeth you may have lost. One of the most effective replacements for a lost tooth is a dental implant, and Dr. Scott Johnson is able to guide you through the entire process. Optima Dental Care offers dental implants for patients in Post Falls, Coeur d’Alene, Hayden, and all surrounding communities. A tooth is made of two parts: the visible part that helps you chew food (the crown) and the anchor that rests underneath the gums and in the jaw (the root). Traditional bridges, partial dentures, and full dentures all replace the crowns of missing teeth, but none of them reconstruct the roots. Not replacing the entire tooth can be problematic because the jawbone tends to shrink when it no longer has tooth roots to support. The process, called resorption, causes significant changes in the vertical structure of the mouth, leading to premature wrinkling and difficulty in eating certain foods. Additionally, traditional dentures are difficult to chew with because the lack of roots makes the prosthetic unstable; it can slip and slide out of place with every bite you take. 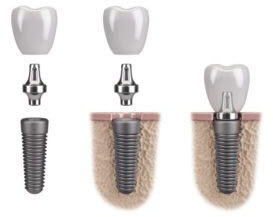 Getting a restoration that uses dental implants, however, replaces the entire tooth, from crown to root. An implant is a post made of titanium, a body-safe material that can fuse with the bone tissue in the jaw. The body naturally accepts the implant as your new root, and titanium’s process of integration provides the support that makes your crown, bridge, or denture more stable. With implants, you can chew the foods you enjoy and avoid the premature wrinkling caused by a shrinking jaw. Dr. Scott Johnson in Post Falls can place implants, monitor their integration, and secure the restoration to restore full function and stability to your smile. Dr. Johnson is specifically trained to place implants and secure implant restorations. Because he can safely perform the procedure right in our office, you do not need to take the additional steps of coordinating with an oral surgeon. However, in cases where you do not have enough bone to host the implant because of resorption, Optima Dental Care will organize your care with a specialist to correct bone deficiency. Dr. Johnson also monitors your healing phase, a four- to six-month period that allows the titanium to fully integrate into the smile. Once the posts are fully fused to the jaw, he will add the prosthetic crowns to give you a functional, healthy smile. Optima Dental Care provides dental implants in Post Falls and beyond. Dr. Johnson will help you stay healthy after tooth loss. For more information, call our office at 208-773-5121 and schedule an appointment today!